This is a great baseball story and an even better one about a crucial moment in American history. When Jackie Robinson was penciled into the lineup for the Brooklyn Dodgers in 1947, America's national pastime and America's future changed forever. How much is reflected in a remark Martin Luther King, Jr. made to Don Newcombe: "You'll never know what you and Jackie and Roy did to make it possible to do my job." Red Barber was perfectly situated to observe this drama. Broadcaster for the Dodgers, friend of Branch Rickey who confided in him before and during the year of decision, and keen student of the game and the behavior of its players, Red held the microphone as the story unfolded with a cast of characters that included baseball immortals Duke Snyder, Leo Durocher, Pee Wee Reese, Pete Reiser, Larry McPhail and Joe DiMaggio. 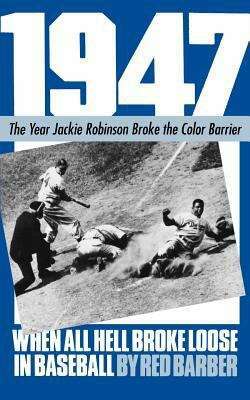 Towering above them all are Jackie Robinson and Branch Rickey, who together made baseball and American history and whose courage and toughness Red Barber captures so beautifully in this book.